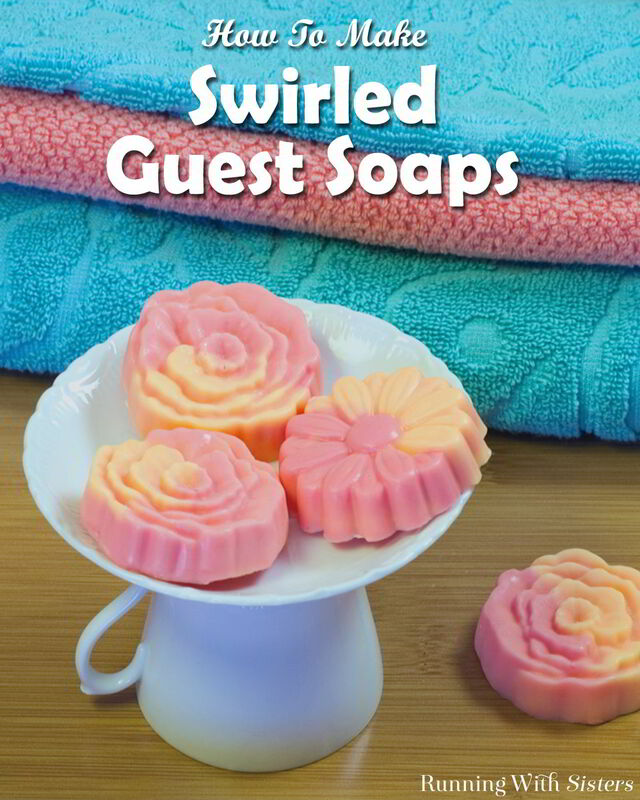 These handmade Swirled Guest Soaps are gorgeous. And the melt and pour soap base melts in the microwave in just minutes, so they are fast and easy to make! 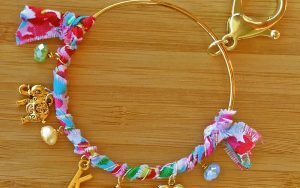 This is a fun craft to do with girlfriends or kids. 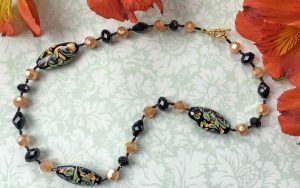 And you can do it in any colors and scents you like! Here’s a video to see how we made the soaps. Follow along, then use the instructions below to make your own. 1. Go shopping for a soap mold. Yay! We found our soap mold at the craft store, but you can use a chocolate mold or cake molds too. Just look for shapes you think will make pretty guest soaps! 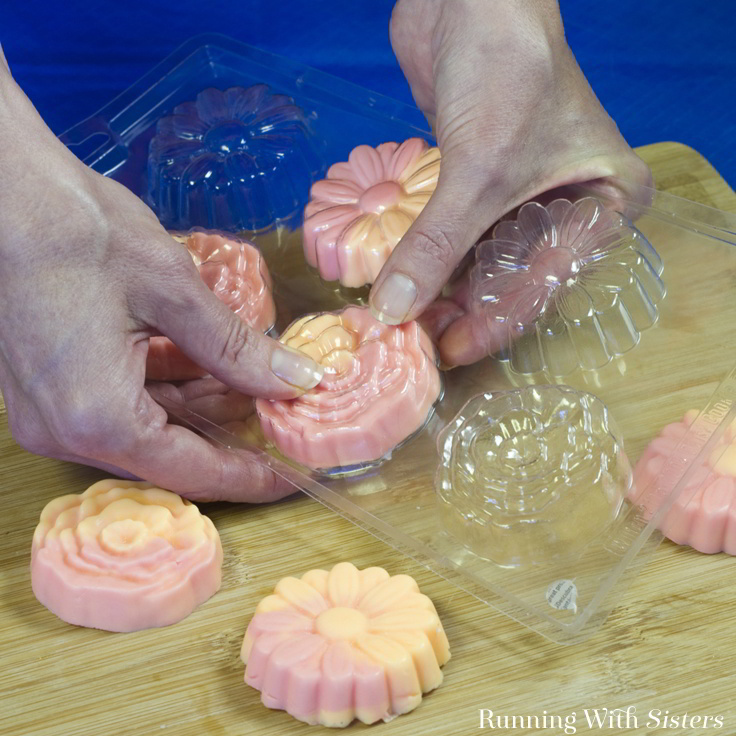 For swirled soaps, we think it’s better to use a mold that is wider than it is deep. 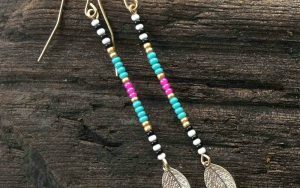 This will give you more room to pour in both colors at the same time. 2. Cut the soap base into cubes. It usually comes scored into one-ounce cubes. Convenient! Fill each measuring vcup with four ounces (or four cubes) of the soap base. 3. Melt each cup of soap base in the microwave. Heat one cup at a time. Start with one minute on high. Check on the soap by stirring with a chopstick. Melt the soap more (by 15 second intervals) until it is melted all the way through. 4. 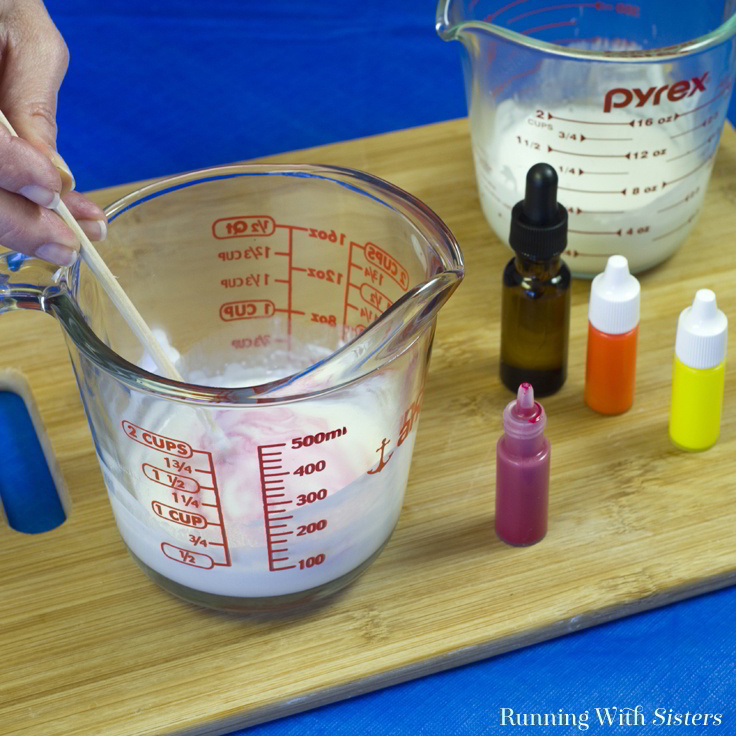 While the soap is hot, add 5 drops of the essential oil to each Pyrex cup. In one of the Pyrex cups, add 8 drops of red, 4 drops of orange, and 2 drops of yellow. Stir with a chopstick to blend. In the other Pyrex cup, add 8 drops of orange and 4 drops of yellow soap colorant. Stir with a chopstick. The soap will cool a little. If a skin forms on top, reheat the soap for 15 to 30 seconds. 5. Now the swirling part! 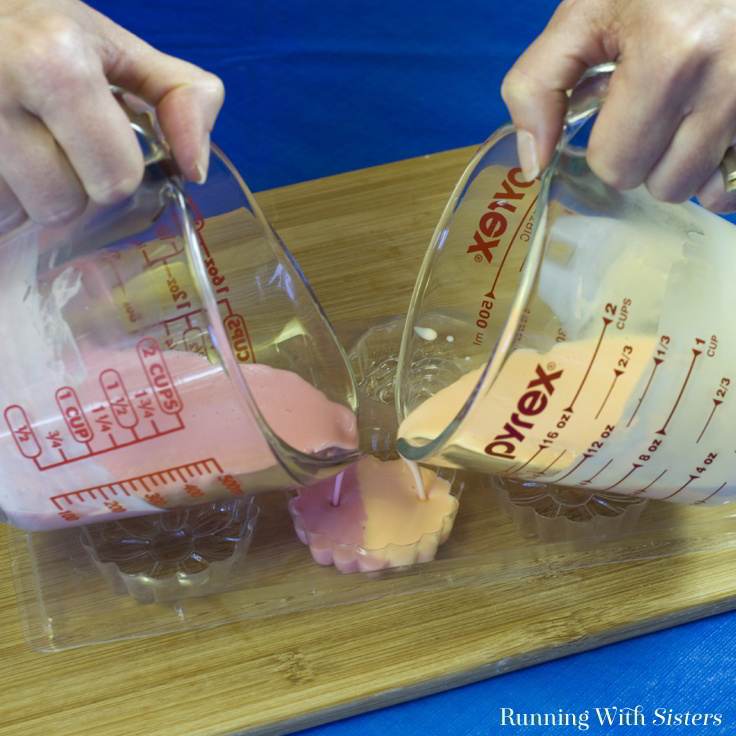 Slowly pour both cups of soap into one of the molds — at same time! Use a chopstick to gently swirl the colors together. Bubbles will probably appear on the surface. 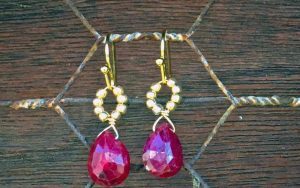 To remove them, spray the still wet soap with rubbing alcohol. It will pop the bubbles. Magic! Repeat to fill all the molds. The soap might cool and form a skin before you are done pouring all the molds. If so, just reheat the soap as before. Once all the soaps are poured and swirled, let the mold cool on a level surface. This might take 45 minutes to an hour. 6. When the soaps are cooled and set up, you can unmold them. To do this, slowly turn the mold over and gently press the back of the molds. 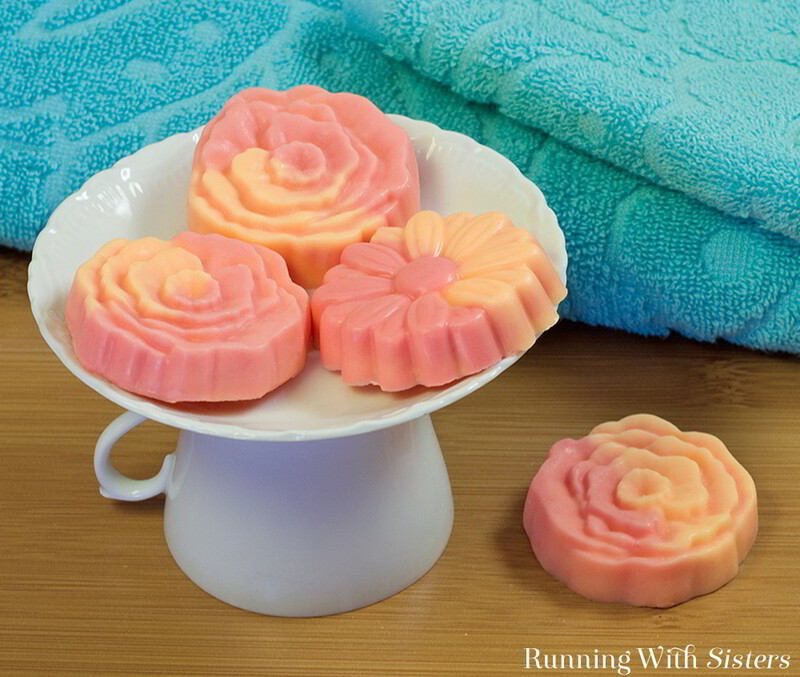 If the soaps are not sliding out easily, you can place the mold in the freezer for one or two minutes. The soaps should shrink just enough to let them slide out. 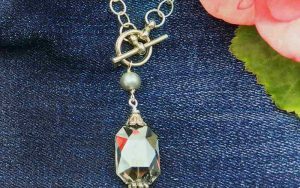 Want another fun little DIY? Make your own soap dish. We found this espresso cup and saucer at a thrift store. We turned the espresso cup upside-down and glued the saucer on top. The perfect place to perch our Swirled Guest Soaps!